Having read Carmen De Luccia’s scathing 4-part review of Spiderman: Turn Off The Dark on Unwinnable last week, I naturally felt compelled to see it myself! As anyone who knows me can tell you, I’m not one to experience stupidity vicariously. My friends might also say that I’m something of a contrarian, so I’m going to make an attempt at a counterpoint here. We’ll see how that works out. a.) Unlike a lot of your belligerent hipsters in their early 30’s, I don’t hate U2! Granted, everything they’ve done in the last decade or so has been pretty staid, and so I didn’t have high hopes for a musical featuring recent Bono/The Edge compositions, but I figured it couldn’t be any worse than American Idiot. b.) I like Spider-Man fine, but I’m not a die-hard fan. I’m not offended by the idea of someone messing around with Spider-Man lore, as long as the alterations stand on their own merits. This wasn’t necessarily the case with Spider-Man: Turn Off The Dark, but we’ll get to that. c.) I saw Starlight Express, a musical in which all of the main characters are toy trains portrayed by actors on rollerskates, and I actually liked it! Mind you, I was 6 years old at the time, but still! I’m pretty open-minded. I also had the benefit of seeing the sixth performance, and it seems as though a lot of the technical problems have been smoothed out in the past week. The stage manager only had to stop the action twice! On the other hand, the one aspect of the play that Carmen singled out for praise was actress Natalie Mendoza ‘s performance, and she suffered a concussion a few days before the performance I saw. It seems as though the understudies in this production will see lots and lots of action. Generally speaking, I can’t get very excited about watching people fly around on harnesses – I mean, it’s not like I would willingly go to a circus or a KISS concert – but the aerial stunts in Spider-Man: Turn Off The Dark felt truly dangerous. It was exciting when Spider-Man and the Green Goblin flew out over the orchestra seats because the possibility of a catastrophic accident felt very real. Lucky for me, I was watching from a safe distance at the back of the balcony. 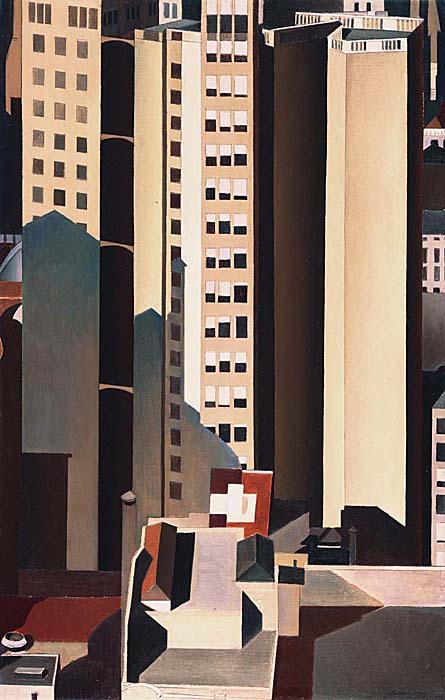 If the aerial stunts were good for cheap thrills, the set design was legitimately great. The designers evidently have taken a playful approach to the task of making 3-D sets out of 2-D comic book panels. Forced perspective is used to great effect, and the weird Cabinet of Dr. Caligari angles echoed the geometric shapes created by webs. 2-dimensional backgrounds folded out, pop-up book style, to become sets. Giant scrims and huge vertical LCD screens displayed industrial landscapes fragmented by crisscrossing webs, reminiscent of Precisionist paintings. Now I guess I should try to say something positive about the costumes. Well, if nothing else, the musical’s Green Goblin make-up is a lot more expressive than that lock-jaw Green Goblin mask from the Spider-Man movies! It’s also kind of of creepy, which I suppose is a good thing since he is a villain. 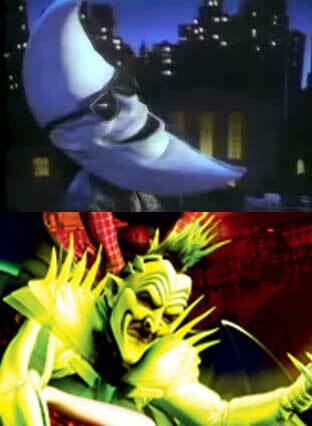 At first I couldn’t put my finger on it, but when I saw the Green Goblin seated at a piano atop the Chrysler building at the end of Act I, it suddenly occurred to me why I found him so unsettling: he bears a bit of a resemblance to that Nightmare-Fueling McDonalds’ Moon Man! At the end of the day, the main problem I had with Spiderman: Turn Off The Dark is the same problem most people had with Spiderman 3: it’s overplotted. They crammed in way too many story threads, and they’re not all treated with equal care. In particular, the attempt to depict Spiderman’s origins seemed half-hearted. Having read Carmen’s description of the shoddy way in which the most important aspect of Spider-Man’s origin story was handled, I paid particular attention to this scene where Uncle Ben dies. As one dissenting commenter pointed out, there is a brief bit of dialogue intended to establish that Peter is indirectly responsible for Ben’s death because he failed to stop Flash’s car from being stolen, but the whole thing was rushed and clumsy, like they knocked out the bare minimum required to set up yet another musical number about Peter Parker’s angst. Many would probably argue that if the story is too cluttered the thing to lose would be the Arachne storyline, which definitely sticks out like a garter-clad extra leg when thrown into the mix with Peter and MJ, the Sinister 6, the Geek Chorus, the power outage at The Daily Bugle, etc. But I have a hard time recommending her for the axe because Arachne’s musical numbers were the only ones that really worked for me. 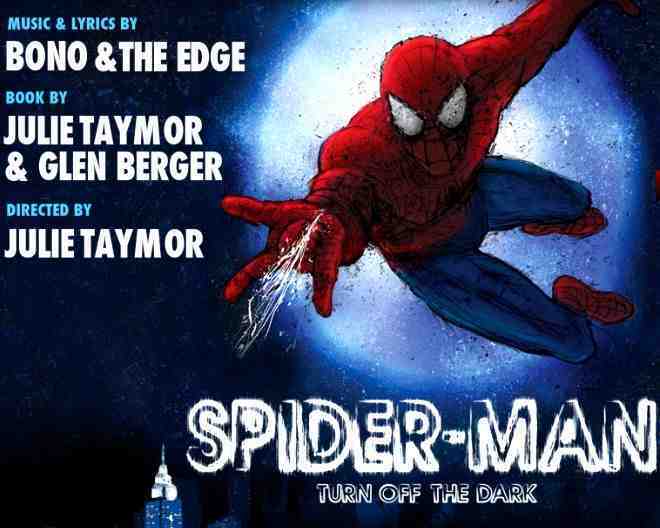 The Peter Parker solo songs that dominated the first act reeked of emo and the Peter/Mary Jane duets that took up the lion’s share of the second act were tooth- and hook-less, but Arachne’s songs had a certain depth that was lacking from the rest of the music. They were interesting, at least. So, will the play bomb? I dunno! Honestly, I’m more surprised when Broadway musicals are actually successful. Why did mainstream American audiences wholeheartedly embrace furries singing T.S. Eliot poems? Why was RENT a hit, with that godawful song about however many minutes you have in your life? Even the aforementioned Starlight Express was successful in the West End (though it flopped on Broadway!). Yes, Spider-Man: Turn Off The Dark is pretty dumb. But, to paraphrase a line used in many an episode of The Real Ghostbusters, it’s so dumb it just might work.